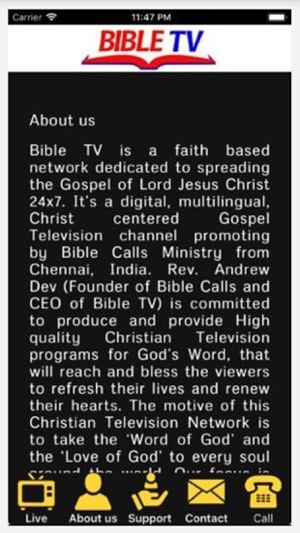 Bible TV is a gospel media taking the gospel to every home and every soul, in their own language .It reaches nearly one million people every day through our local cable network. God has opened a wide door through this television network to reach Christians and non-Christians. It’s an end time trumpet to all Nations to proclaim the first coming of Jesus and to prepare the world for the second coming of Christ. More over this media ministry is taking the gospel to all nations through cable and online. Nearly one million viewers get the opportunity to hear the gospel every day. The programs offered by the web channel are rich in content, diverse in nature, top in quality and interesting for family viewing. They are sure to bring heavenly comfort and encouragement to every viewer. 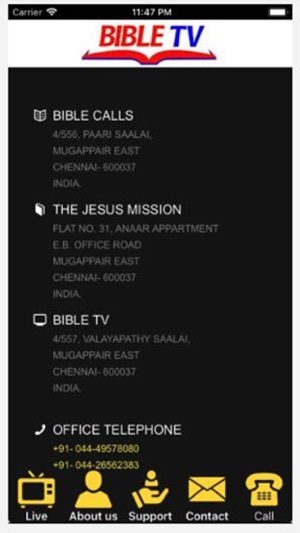 These Christian devotional programs are aired on Bible web TV, delivered in various languages including English, Tamil, Hindi, Malayalam, Telugu, Kannada, and Baduga and other languages.